What is a Facebook Dark Post and How Do I Create One? Dark (unpublished) posts are a great way to tailor different messages to various audiences without posting multiple messages to your page timeline. Different to a targeted post which only allows you to target an audience based on parameter such as gender, relationship, educational status and so on, dark posts allow you to use keywords (like job titles or more broad interests) for targeting. A dark post also differentiates itself from a regular targeted post as it publishes without showing up on your page’s wall itself – targeted fans will only see the post in their newsfeed. The main purpose of these dark posts are to promote a specific message without cluttering up the newsfeed for those who would view it as irrelevant. So, how do I create a dark post? 1. Log in to Facebook Business Manager and click ‘Business Manager’ in the top left. 2. 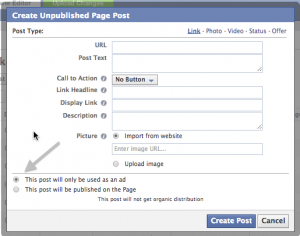 Select All Tools from the menu, and then under Create and Manage click Page Posts. 3. If you manage multiple pages, select the Page that you want to create a dark post for from the left drop down menu. 4. Click the blue Create Post button. 5. In the dialog box, choose the type of post your want to create and enter the info you want to include in your post. 6. 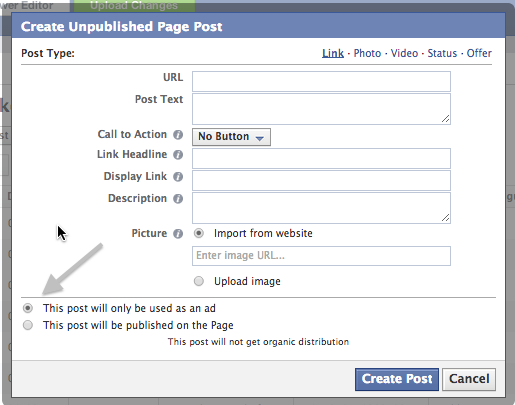 Select This post will only be used as an ad to restrict the post from appearing on your Page. 7. Click Create post. Keep in mind this post isn’t published yet. It’s saved in the list of your posts, and if you publish the post on your Page, you’ll have the option to only show the post to specific languages and locations. Now that you know how to create Dark Posts, you’re ready to start making ads and publishing your dark posts!